King room taken in too small compare to other hotels. Only one chair and a small chair available instead of two chairs, one Sofa and one writing table shown in property pictures in booking.com. How can two person sit in one chair. Breakfast was good and the atmosphere is quite relaxing. While we liked the hotel the staff are what really stand out. Excellent service and attitude throughout the hotel (front of house, kitchen, service, cleaning, gym etc). Too many names to thank all but a mention to: Rochelle, Flerida, Ajit (thanks for my amazing morning chili omelettes), Alexandria, Remy, Ruth. Location, price and the staff were amazingly helpful! The staff are so great and very accomodating. The place is in good location. 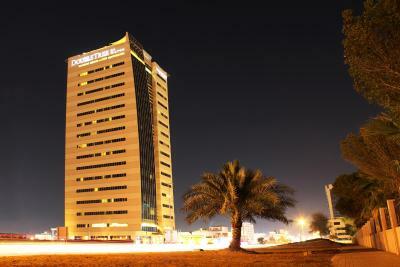 The property was in town which made it accessible to the old rak and corniche. Large rooms with comfortable beds. Value for money with the rate we received through booking.com. DoubleTree by Hilton Ras Al Khaimah This rating is a reflection of how the property compares to the industry standard when it comes to price, facilities and services available. It's based on a self-evaluation by the property. Use this rating to help choose your stay! 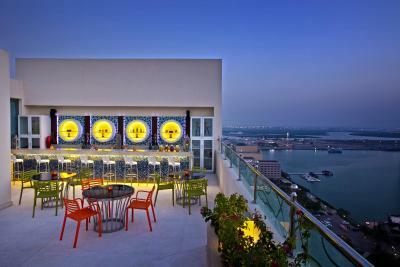 One of our top picks in Ras al Khaimah.Overlooking the Ras al Khaimah Creek, this luxurious 4-star hotel features a rooftop pool with a lounge and a full-service spa. 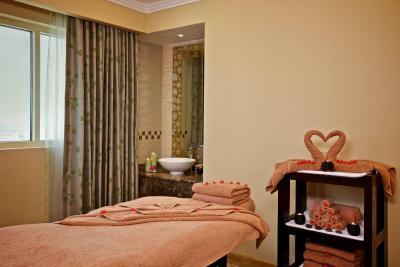 Doubletree by Hilton Ras Al Khaimah's spa features various massages, facials and pedicures. The hotel’s Fitness by Precor has cardio equipment and free weights. Guests can also take a free shuttle to DoubleTree by Hilton Resort & Spa Marjan Island, where extensive facilities include a kids club, a watersports center and a 1,350 feet private beach. Dubai International Airport is 50 minutes away by car. 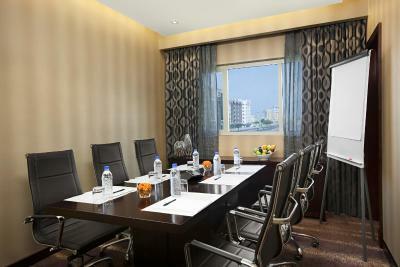 When would you like to stay at DoubleTree by Hilton Ras Al Khaimah? This elegant and modern room features partial city or creek views. 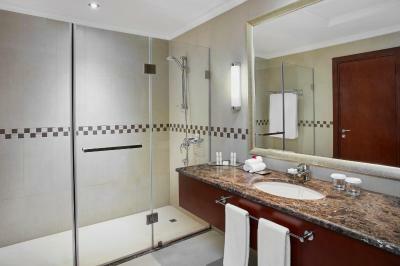 The Deluxe King Room has a small seating area within the room and a satellite 42- inch flat-screen TV. This elegant and modern room features partial city or creek views. The Deluxe Twin Room has a small seating area within the room and a satellite 42-inch flat-screen TV. 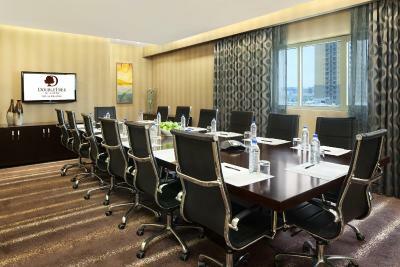 This elegant spacious and modern suite features a large living room with a work desk and a 42-inch LCD TV with satellite channels. This elegant and modern suite features a sofa bed and a king bed. This double room has a mini-bar, air conditioning and small seating area within the room. This double room has a mini-bar, small seating area within the room and bathrobe. This suite has air conditioning, satellite TV and mini-bar. A cosmopolitan base in 'The Rising Emirate', the DoubleTree by Hilton Hotel in Ras al Khaimah offers stylish accommodations in the city center business district, walking distance from shopping, RAK Exhibition Center and the Free Trade Zone. Enjoy the best views in the city on the hotel's rooftop, which features a sparkling swimming pool and live music at TreeTop Bar. 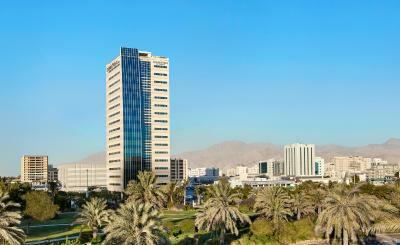 House Rules DoubleTree by Hilton Ras Al Khaimah takes special requests – add in the next step! One older child or adult is charged AED 100 per night in an extra bed. DoubleTree by Hilton Ras Al Khaimah accepts these cards and reserves the right to temporarily hold an amount prior to arrival. booked on the same meal plan as the parents. - Children ages 13-18 years old will be considered as adult as per hotel policy. - Cancelations will result in a charge of 1 night’s room and tax (10% service charge and 5% VAT) to the credit card provided at time of booking. I liked everything.the staff were very friendly. The cookies and the access to resort, it was awesome. Very accommodating and considerate staff esp. Ms Ruth. 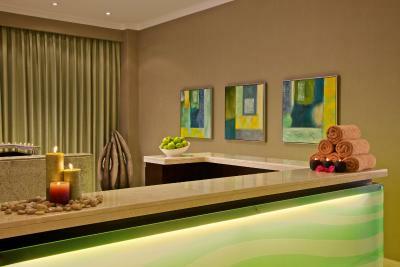 Spacious room and a complimentary upgrate from deluxe room to junior suite room. 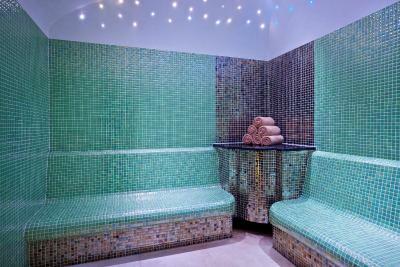 Free use of Jacuzzi and steam room. 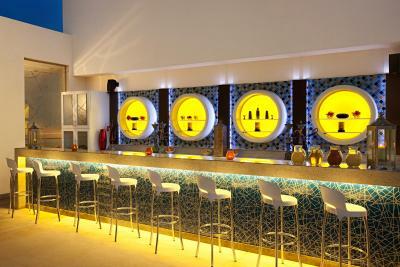 Free access to Double tree marjan beach resort. Thought we booked the Double Tree on Al Marjan Island and were extremely disappointed when we realized there were two hotels. 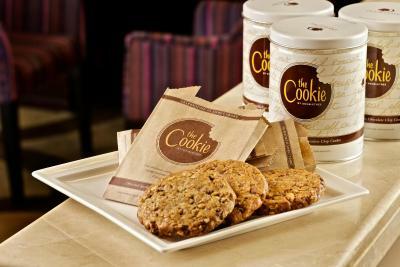 Liked the upgrade to a deluxe room and the cookies of course! I had a comfotrtable stay with my mother. Facilities were good and enjoyed the opotunity time go to Majan island via shuttle. the staff were very helpful and friendly. The cookie upon check in was a nice touch. Accomodating staff and the cookies superb!!! I like the location, staff support, cleaness, and value for money. Beds were uncomfortable. Service wasn’t prompt. Restaurant wasn’t good. Wouldn’t advise staying at the property. Not much. Access to the Hilton Marjan Island Resort was worth it. We spent a nice afternoon there. This property although doesn’t have much.